^ Cold and Warm Episodes by Season. 2014-08-04 [2015-06-10]. （原始内容存档于2015-05-06）. ^ 2.0 2.1 2.2 2.3 2.4 2.5 2.6 Lawrence, Miles B. Preliminary Report: Hurricane John: August 11 - September 10, 1994 (GIF). United States National Oceanic and Atmospheric Administration's National Weather Service's National Hurricane Center. 1995-01-03 [2015-06-10]. （原始内容存档于2013-10-29）. ^ 3.0 3.1 3.2 3.3 3.4 Glossary of NHC Terms. National Hurricane Center. 2013-03-25 [2014-06-15]. （原始内容存档于2014-06-01）. ^ 4.0 4.1 4.2 Mayfield, Britt Max; Pasch, Richard J. 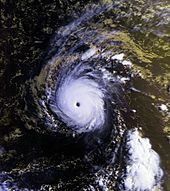 Eastern North Pacific Hurricane Season of 1994 (PDF). Monthly Weather Review (American Meteorological Society). 1996, 124: 1585–1586 [2015-06-10]. doi:10.1175/1520-0493(1996)124<1579:ENPHSO>2.0.CO;2. ^ Lawrence, Miles B. Tropical Depression Ten-E Discussion Number 1: August 11, 1994 09z. United States National Oceanic and Atmospheric Administration's National Weather Service's National Hurricane Center. 1994-08-11 [2015-06-10]. （原始内容存档于2014-08-12）. ^ 6.0 6.1 6.2 Lawrence, Miles. Hurricane John Preliminary Report (page 2) (GIF). NOAA. 1995 [2015-06-10]. （原始内容存档于2012-10-13）. ^ Annual Tropical Cyclone Report (PDF). Joint Typhoon Warning Center: 128–133. 1994 [2015-06-10]. （原始内容存档 (PDF)于2013-02-21）. ^ Dorst, Neal. Which tropical cyclone lasted the longest?. NOAA Tropical cyclone FAQ. NOAA. 2004 [2015-06-10]. （原始内容存档于2015-03-27）. ^ Dorst, Neal. What is the farthest a tropical cyclone has traveled?. NOAA Tropical cyclone FAQ. NOAA. 2004 [2015-06-10]. （原始内容存档于2015-03-26）. ^ National Hurricane Center; Hurricane Research Division; Central Pacific Hurricane Center. The Northeast and North Central Pacific hurricane database 1949–2013 (TXT). United States National Oceanic and Atmospheric Administration's National Weather Service. 2014-07-07 [2015-06-08]. （原始内容存档于2014-10-05）. A guide on how to read the database is available here. ^ Kristina Pydynowski. Rare Switch for Genevieve: Hurricane to Super Typhoon. Accuweather. 2014-08-07 [2015-06-10]. （原始内容存档于2015-05-29）. ^ 13.0 13.1 13.2 Central Pacific Hurricane Center. Previous Tropical Systems of the Central Pacific. [2015-06-10]. （原始内容存档于2015-05-08）. ^ Eastern North Pacific Tracks File 1949–2007. Atlantic Oceanographic and Meteorological Laboratory. 2008-03-21 [2009-01-15]. （原始内容 (TXT)存档于2009-01-15）. ^ National Climatic Data Center. Event Report for Hawaii. National Hurricane Center. 1994 [2012-01-12]. （原始内容存档于2012-01-12）. ^ Staff Writer. 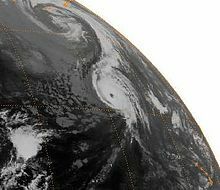 Island braces for Hurricane John. Gainesville Sun. 1994-08-26: 4 [2015-06-11]. ^ Landsea, Christopher W. Tropical Cyclone FAQ Subject: D6) Why are the strongest winds in a hurricane typically on the right side of the storm?. Atlantic Oceanographic and Meteorological Laboratory. National Oceanic and Atmospheric Administration. [2015-05-26]. （原始内容存档于2015-03-26）. ^ Storm Data: A Composite of Outstanding Storms (PDF) 36 (9): 60. 1994-09 [2014-08-14]. （原始内容 (PDF)存档于2014-08-14）.